Imagine a world without Agatha Christie. Miss Lemon simply can't do it. 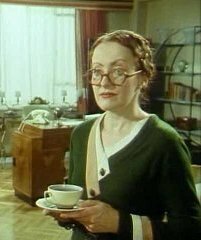 It seems as though she, and the inimitable characters of her creation -- Hercule Poirot, Miss Marple, Mr. Satterthwaite, Mr. Parker Pyne, indeed, Miss Lemon -- have been around as long as movable type. And yet, as difficult as it is to believe, 2011 marks a mere 91 years since the publication of her first novel, The Mysterious Affair at Styles (1920) and the debut of that famously fussy Belgian detective. The success of Agatha Christie's first novel launched a career among mystery novelists that, in terms of recognition, endurance and influence, has yet to be rivaled. Yet Agatha Christie's style is not everyone's cup of tea. Condemned by more than one critic as 'elitist,' 'escapist,' and 'wooden,' Agatha Christie's works continue to sell -- by Miss Lemon's reckoning, more than two billion of her books have been sold so far, and the tills continue to ring apace. Escapist? Perhaps. Characters that lack nuance? One could make a case. However, there's no denying that Dame Agatha could craft a mystery cleverly enough to keep even the sharpest of armchair sleuths second-guessing the murderer's identity. And yet, Agatha Christie never played fast and loose with the clues. Adequate evidence is always there for the reader to solve the crime -- as long as he or she is astute enough to detect it. In Agatha Christie's Secret Notebooks, John Curran points out that one possible clue to Agatha Christie's enormous success as a mystery writer is her mastery of the double-blind -- or that fine authorial touch that makes the most obvious suspect the least likely to have committed the crime. In lesser hands, mystery novels that depend on this technique tend to fall flat. In compiling the published Secret Notebooks, Mr. Curran had the enviable task of going through more than 70 of Agatha Christie's manuscript notebooks, tracing the threads of plot outlines, character sketches and random thoughts that, strung together, provide clues to the creative ingenuity that stood behind so many of her excellent crime stories. Miss Lemon can't wait to get her hands on a copy. As all serious admirers of Agatha Christie know, 15 September is the anniversary of her birth in 1890. This post is part of the Agatha Christie Reading Challenge that today celebrates her 121st birthday. Please join in the felicitations. And that's the beauty of her work, I think ... complexity couched in simplicity. Agatha lulls her readers into a false sense of security, and then bang! They're handed another surprise ending. The more of her books I read the more convinced I am that she was a genius. Her books appear simple but they're so well plotted that you don't notice the depth at first. I'll be reading John Curran's book for sure. I was going to say just what Margaret did. I think she was a genius. I think she offers a great deal of depth to her characters. Human beings are complex, and she writes of the complexities in such an interesting way. I've found myself referring to her in regular conversation ever since I've been reading Agatha more seriously. I'll say, well there was a character who said or did much the same thing. :<) Sometimes because an author is prolific and popular the critics begin to criticize them. I put Agatha in the same category as my most favorite of all time, P.G. Wodehouse. That's the highest praise this reader can offer. Absolutely. You are both right on the mark! As anyone who ever attempts it will discover, writing a plausible, readable, well-paced mystery novel is no mean feat. A terrific post, Miss Lemon. Agatha Christie has always been under-appreciated and her writing under-valued by critics. But, luckily for the rest of us, we know better. I wonder if she knew how much she was appreciated by her fans and how many people she made happy just by the reading of her books. Happy Birthday today, Dame Agatha!